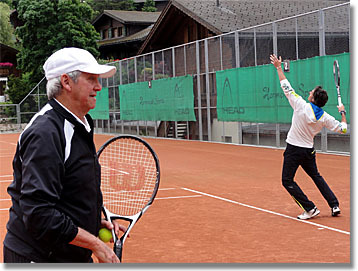 Emmo and the serve: Roy claims his was "pathetic", so teaching pro Michel shows us how it's done. 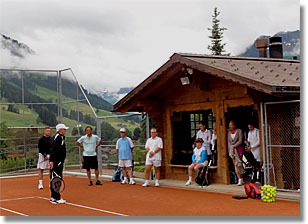 Today, we worked on the serve and the backhand, we once again wrestled with the Swiss ski team for the best desserts, and we wound up in a beautiful Austrian/Swiss restaurant—the Grand Chalet—on a hillside overlooking the Gstaad valley, eating veal a la Emerson, drinking champagne, and listening to Emmo and his wife of nearly 50 years, Joy, reminisce about the early tour years when they stayed in a Parisian brothel (they didn’t realize it until doors began slamming in the wee hours), played stops like Barranquilla, Colombia, and eventually befriended the movers-and-shakers who would fill their Tennis Weeks in the early years—the Shah of Iran’s wife and friends, Buffalo Bills owner Ralph Wilson, still on the court at age 90, jet-setting socialites, captains of industry. It’s hard to fathom what you came here for, if it wasn’t for this. Each day begins with a pep talk. Not everyone makes it on time. Fabienne had a question. Why would he, when he was about to serve, always make a circular motion with his racquet, as if he was mixing a cake? One of the pleasures of a week like this is getting to know the campers and the staff. Patrick, a local teaching pro, is also a musician, whose performances can be found on Youtube—search for “thesnowmountain.” Joy Emerson was a junior player in Australia, and she and Roy met at a tournament where he, instantly smitten, volunteered to ballboy her match. As far as I could tell, they’ve rarely been apart since. And several of us shared travel tales, business and otherwise. Saniya, a London banker and a member of the Queens Club there, talked about dogs in First-Class seats, specifically a doberman whose owner was an airline executive. 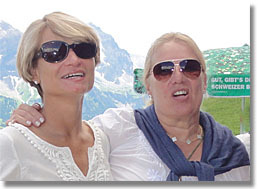 But Steffi, a lawyer also based in London and also a member of Queens, won the prize. You have inspired me to get out of bed and milk the Mooney’s cows. It may improve my forehand.